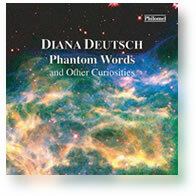 This set of demonstrations shows a remarkable dissociation between musical tones and spoken words in memory, and indicates that different memory stores are responsible for retaining the various aspects of sound. The CD presents enough test patterns to enable people to conduct entire experiments on this effect. Why should this be? One possibility is that we retain pitches in a specialized memory store, and that memory loss is caused by interference between pitches that are held in this store. If this were so, then presenting other types of material during the time interval between the test tones should not interfere with memory for pitch in the same way. The examples played here consist of patterns in which two test tones are again separated by an interval of five seconds, but now six spoken numbers are presented during this interval, instead of six extra tones. 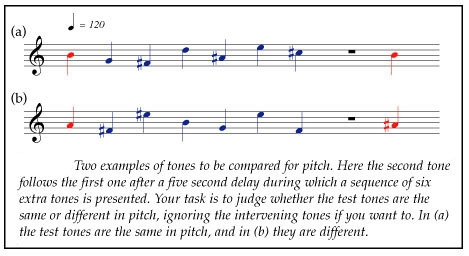 Listen to the first test tone, ignore the spoken numbers if you want to, and then judge whether the second test tone is the same in pitch as the first, or different. 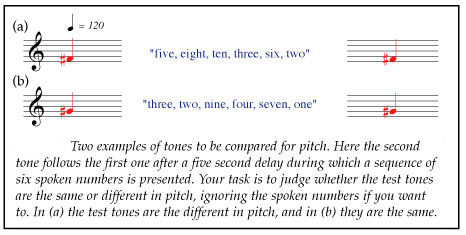 Most people find the memory task much easier when spoken numbers rather than tones are played during the interval between the test tones. This contrasts remarkably with the memory loss that occurs when a sequence of tones is played during the interval between the test tones, even though the extra tones can be ignored. So we conclude that the pitch of a tone is held in a specialized memory store, and that interference takes place between pitches inside this store. Other materials - such as spoken numbers - do not enter the store, so they produce much less interference with memory for pitch.